Never has it been more important to continue the fight to stop the Empire’s war as it is now rampant and pervasive. Good people need to join and fight this battle, and the good news is that we are most definitely making a difference. I now appeal for your support in the form of donations. keep us independent and beholden to no-one so that we can keep on speaking honestly. We were fortunate in that we did not need to do a summer appeal for funding and our last appeal was in March 2018. We are totally in the hands of our readers as The Saker is fully reader funded. This is what makes The Saker different. 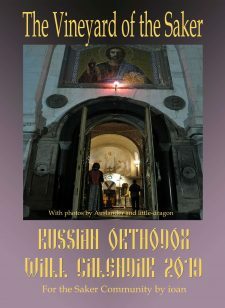 In a time where we see either/or analysis, Putin-worshippers and Putin-bashers, or Russia-worshippers and Russia-bashers the Saker blog offer a critical but still fundamentally pro-Russian outlook and analysis. This is quite unique, really. 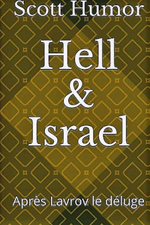 The idea is not to make the ideologues hate us for it, or to make one or the other side happy, but to help our readers understand all the complexities of Russia and her situation in the struggle against the AngloZionist Empire. The same goes for Novorussia/DNR/LNR: we fully support their struggle, but we do so critically and we are not afraid to draw attention to real problems when they appear. Likewise, we are extremely critical of Orthodox “Judaism”, Zionism and Israel, but we absolutely refuse to join into the sophomoric Jew-hating fest seen on some pro-Russian websites. Keep it simple, stupid, is not what we do at The Saker because we do not shy away from complexity and nuance. We never use advertisements, no annoying pop-ups, there is no paywall and most important, we are truly independent: we do not accept funds from anyone that has an agenda to steer The Saker into an ideology. There is no news aggregation at The Saker (except in the minor “watch list” category), so, the blog is unique. 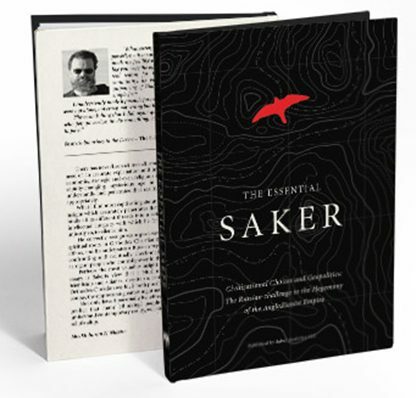 We present to you, the readers/analysts/students/watchers of geo-politics, original work specifically written for the Saker blog. Cross-posting is done rarely and then only by special agreement with, and with permission of, giants in the field such as Pepe Escobar. We post articles from expert guest authors, not just the same repetitive 1 or 2 full-time in-house resident pseudo-experts. 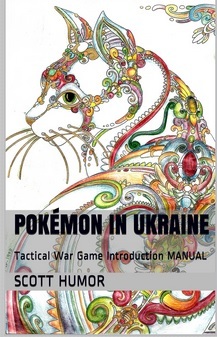 This improves the quality of information at The Saker immensely. Our guest authors have very different (often categorically opposed) views and beliefs and the Saker blog does not follow one single political/ideological line, unlike many. Here on the Saker blog, you see every possible view. The Saker writes at least one full length weekly analysis, or an in-depth interview with voices that need to be heard and want to hear about the real state of the Empire’s war. When events demand, the Saker does time critical updates. Most recently we had the missile strikes on Syria earlier in the year and now we have the Israeli ‘mistake or extreme miscalculation‘ and we have been covering that, but not presenting woolly theories that do not match the reality on the ground (or in the air). The Saker Blog has been tremendously enhanced by exclusive translations of the very best Russian analysts (like Ruslan Ostashko or Rostislav Ishchenko). This is by agreement with the translators, the original work is offered, and we do not just take these off the Internet. We encourage serious discourse and for this reason the comment section is carefully moderated and trolls and other discussion hijackers are mercilessly sent to trash. Finally, we have no powerful backers and no accounts to give to anybody and we therefore don’t have to seek popularity or cater to any one political line: we call things as we see them. 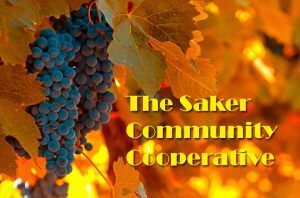 Regarding TheSaker.is blog: The broader Saker Community is still growing. In this year we’ve added the video translation section, and the community co-operative (standing on its own feet) is available for book sales, publishing or editing services and we are able to avoid resellers like Amazon completely, when necessary. This small community site now offers to our authors translations from French, Italian and Spanish as well. My congratulations and heartfelt thanks to the commentators that keep the level of discussion professional, heartfelt and always very interesting. My appreciation and thanks to the moderators for the frequently underappreciated task that they do, even sometimes under stress. I now need “ammo” for my battles in the form of donations to continue. If you are able to give a donation, your generosity is deeply appreciated, but if you are not able to donate, a prayer from your heart for me is the most valuable gift that you can give. Will send a donation in the next few days. Just confirm it is the same bank account as last time – new phone, so may have to ask you via email for details. Yes, same details, no change, thank you! My dear Friends ! 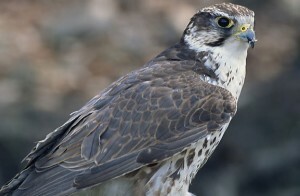 Please donate for the Saker ! You will not feel sorrow for that. we are a singularity (this blog) in this world, nobody has something similar to this, nowhere is the place so near to our hearths as in this place – I know, were’re not perfect, but, my fellow friends in struggle, we found here our voice to be heard, your thoughts to be shared. You have no idea of the power your words are giving to many people through this blog ! It is Your Voice, given freely by You to the entire world ! You think this is in vain ? No my friends, it isn’t , You have to know that. remember, not everyone is posting, much more people are reading all what You my friends, are sharing with them ! You think that this is insignificant ? Not at all ! You are wonderful people who take the time and willingness to Share. That is the best what this Blog can offer. Please don’t forget that ! Of you ask me, I’m so poor and have so many difficulties but I don’t care, I love this Blog and I do everything to help, if not with money, then with works I can do for this Blog. Don’t forget, maybe we are the ones who are laying the pavement for a better future. There is something *everybody* can do, even if dirt poor: just say a tiny hyper-short prayer for me. Something like “God have mercy on your servant Andrei” just *once* would be plenty. Takes 2-3 seconds! And that is what I need most, really! And if you are an agnostic/atheist, that is even better. God rarely get prayer from agnostics/atheists, He will pay even more attention than usual. Really, I mean it! 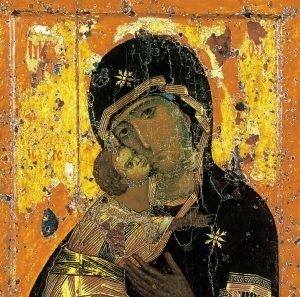 Dear Gods, have mercy on your servant Andrei, and please reward those that tell the truth with their voices heard. Agrego municiones, hermano … porque creo en ti. Muchas gracias por tus municiones y, aunque mas, por tu fe en mi lucha! Just donated $100. 00 Enjoy your work very much! I wish we could talk about your packaging/marketing stuff above. I am a big van, and am happy to have been able to give my two cents worth; I am always trying to be more regular, in several things in my life, and this is one of them; working on it. But the… pitch, where it deviates from … my perception of the oasis, I believe it becomes less effective. For example, you state, “… fundamentally pro-Russian outlook and analysis…”; and you go on to tout it. My perception, … I see it as fundamentally unbiased; and that is why it is an oasis… of purer information. I seek to avoid bias, including a pro-Russian bias. The only reason I endorse (really too strong a word in my case, but everything is relative) the Russian leadership, is that they are doing a better job than most, and have in my life time, overcome great essentially evil disadvantages, to get to where they are, which is basically relevant; and from that position, making moves that I believe, favours the ongoing interest of humanity (even non-Russians). Your oasis, like the good captain of a boxing gym, has a ‘culture‘ which dissuades the really… less sincere, and favours… integrity…. somehow you and your associates do this. Well stated One Tribe. Integrity! And this is the heart of the matter and is why I volunteer at The Saker. Its time to Step up to the Plate all the good people. Dig into those pockets if at all possible and let’s keep this place functional and flowing! (The prayers as well). I have a serious question. I’m retired, on a fixed income. There are so very many great sites out there that need support–but the budget stretches only so far. So: is it better/more desirable/more efficient/more equitable to give a little to a lot of sites, or one donation to one site? Help! It’s difficult to make a decision in your place brother, I made my decision, you make yours. As far as you are here and post this, that means you have taken your decision, OK ? In the “many vs. few” question, my own practice is to choose *a few* sites/blogs (ca. 3) that I want to support, and do so with small *but regular* amounts. One cannot support everyone who needs support, so at least try to be consistent, and somewhat focused. In addition, if an appeal is made in a special case (e.g., legal fees for someone who deserves help) I make a one-time donation. Or, if I realize that a blog that is not one of my main three also deserves some support. For example, if Craig Murray makes an appeal, I send some $$ because I really want to keep his voice out there—in defense of Julian Assange; in criticism of the Skripal circus—even though his blog is not one of my regulars. I don’t have a lot of money, so all donations are small. My own preference is to make 4 donations of $25 than one of $100. That way I know I am always able to respond to an appeal. That is why I suggest to The Saker that he not be shy about making regular appeals. I hope this input is useful to you. Number one. You need to specific with what you need help with: hosting of the website, renting a mailbox, etc. Then provide people with exact way to reimburse you for that. Number two: if you decide to be in pursuit of selflessness, then everything else will take care of itself – even if you and your site cease to exist. Number three: your content is amazing, what will make you more amazing is if you stop asking and continue pushing in direction of selflessness. Never needing anyones help or donation and trusting the universe. Actually no. That is why *you* can chose to do with your blog. And if the universe pays your bills, that is a very sound approach indeed. Good luck! 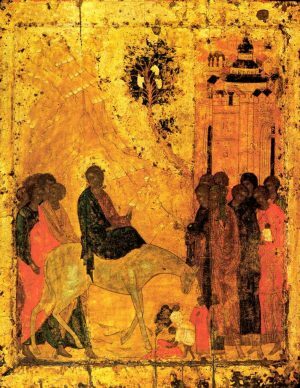 Saker, this is undoubtedly one of the finest English language alternative sites pertaining to Russia and Russia’s activities in various parts of the world. In terms of income, I’m one of those “poor” people who lives solely on a Canadian government old age pension, which is, little by little, being eaten away by the policies of our leaders that create this insidious inflation. But in terms of spirit, I enjoy peace and contentment, although my spiritual belief system doesn’t fit yours in that I couldn’t morally pray to an entity I don’t believe exists. So here’s a suggestion. One of the reasons why people (and I include myself) may be reluctant to donate is because they have no idea how their donations are spent. For all we know, VVP receives a 5% commission every time you say something positive about our hero ! ;-) I believe it would be a “first” in the alt. media! I’m not questioning your integrity, on the contrary, every indication is that you are a very sincere and moral man, and that is another reason to provide you with financial support. I offer a product, and each person is invited to support my work on a 100% voluntary basis. If what I do is worth, say, 50 cents, then a person can send that. If it is $100, then a person can send that. *You* decide what this blog is worth to you – not me! Also, last time I checked, when you purchase loaf of bread, you don’t ask the baker what he is going to do with the money, do you? In my ‘bakery’ you get to walk away with a loaf of bread without having to pay even one cent for it. But if *you* feel like dropping something in the tip jar, that jar provided. That’s all. Furthermore, if you live on a small income, I rather you not donate it to me, really. There are enough people out there who can support my work without hurting, so why have those for whom this is a major sacrifice contribute? One way to look at it is to add up the cost of subscriptions to journals, newspapers, magazines, etc. that one either does subscribe to or does NOT any longer subscribe to. What is it worth to get valuable information, analysis, and even some entertainment? Surely at least the cost of a sub to Harper’s, LRB, the NYT (ugh, waste of money these days), not to mention pretty high monthly cable fees (if you watch TV, which I do not) that a lot of people pay to facilitate inserting nonsense into their brains. Thus, on a purely value for money basis, compare the cost of paying for MSM communications media with the cost of “subscribing” to alternative media instead. Choose the information sources you rely on and support those. i cant donate b4 the 19th or 20th this month, but i will send you a few $ then. Thank you Saker for all you do!! Small donation made, prayer passed on, and always willing to do my little part to be of service. 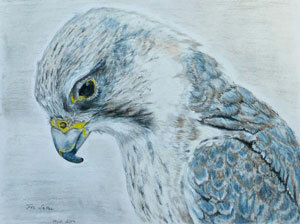 I ve had som bad conscious with the Saker since it was a while ago I donated. Now is done.